Let me start by saying that this is one of the best books I have ever read. 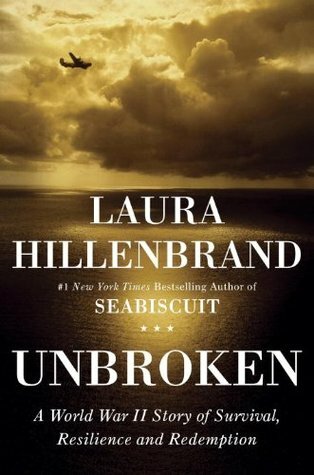 UNBROKEN: A World War II Story of Survival, Resilience, and Redemption by Laura Hillenbrand, is #1 in New York Times’s Bestseller list and will soon become a motion picture. It is a biography of Louis Zamperini, an airman who suffered the unimaginable in the hands of the Japanese, as a prisoner of war. This remarkable and well-written story was extensively researched and documented during the course of seven years. It enlightened me about the role of Japan in the war, which has been far less written about than Germany. The horrors were equally as devastating. One could expect this book to be dreadfully depressing or over-500-pages-of-boring. It’s neither. It kept me fully engaged, and even though there were times when I felt I couldn’t take any more devastation, I persevered because I expected redemption to come (as expressed in the title). Indeed, the book cover reads: “Survival, Resilience, and Redemption”, and that is exactly what shines through the story, in powerful fashion. I was rooting for Louie Zamperini from the very beginning of the narrative. During the course of the book, I was rooting for the many others who surrounded him and who made their way into the story. Last night, as I finished the book, I found myself crying out loud and thanking God for the good that can come out of evil. I give this book 5 out of 5 stars! So go and buy it, or downloaded, or whatever you do to get a hold of your copy. Hurry! ← Can I just brag?